I recently saw the IMAX film, Tornado Alley, by storm-chaser/filmmaker, Sean Casey. The film follows both the storm-chaser and a large team of scientists from the VORTEX 2 project. Working separately, both groups were following storms in Tornado Alley, a wide open area in the central US that runs between the Rocky Mountains in the west and the Appalachian Mountains in the east. This is where most of the tornadoes in the US occur. The goal of the storm-chaser was to drive into a tornado and capture the experience on film. 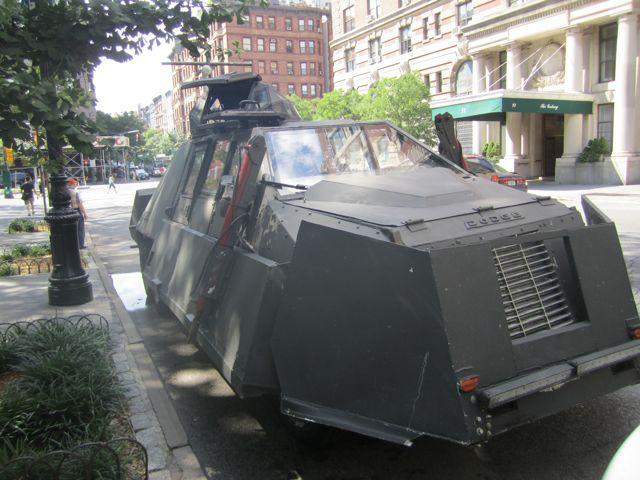 Casey built a special vehicle for the task called the TIV (Tornado Intercept Vehicle). Constructed of armor-like steel and aluminum plating with bullet-proof glass, it looks like a tank with a special IMAX camera turret on top. The VORTEX 2 team was trying to get as close as possible to the storms without getting sucked inside. They were monitoring the tornadoes with remote equipment and collecting data. Their goal was to study the structure of the storms and try to understand why some thunderstorms become twisters and others do not. This sort of information could produce more accurate forecasts and increase the warning times for approaching tornadoes. Overall, I enjoyed the film. It was educational and had a sense of adventure with great footage. It is currently playing at the American Museum of Natural History in NY. This entry was posted in weather and tagged arts, storms by Melissa Fleming. Bookmark the permalink.